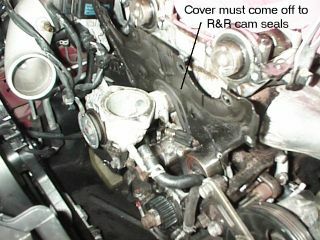 The Miata water pump is located behind the timing belt. Unfortunately, if your water pump craps out, you need to do an entire timing belt job in order to replace it. 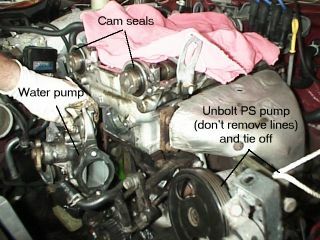 Many people believe in prophylactic replacement of the water pump when the timing belt is done. The idea is that since you're already doing 90% of the labor to replace the belt, the extra work to do the pump isn't too much. On the other hand, you may be tossing out a perfectly good water pump long before it's necessary. Our water pump made it 170,000 miles. We would have thrown out good water pumps at 60,000 and 120,000 had we replaced them at the time. Still, this is a personal decision you need to make. To replace the water pump, start with the Timing Belt instructions. Once you get to the point where it tells you to "change the water pump", come back here. We're not sure if it has to come off, but the job is a bit easier if you remove the cover plate marked with the E/I positions for the timing marks. If you replaced the cam seals, this had to come off anyway. Remove the timing belt idler pulley and the tensioner pulley. Don't lose the tensioner spring - you'll need it on the new water pump. Completely remove the pivot bolt from the power steering pump. Don't disconnect the oil lines, but move the PS pump out of the way and tie it off. You'll need the access space to remove the water inlet pipe flange. Unbolt the water inlet pipe flange. The upper bolt isn't too bad - you can use a socket on an extension. The bottom bolt will require a box end or open end wrench. It's a bit tough to get to. Unbolt the 4 bolts holding the water pump to the front of the motor. Gently lift the water pump away from the motor. Some water will pouring out, but you've already got a catch pan underneath, right? Leave the old gasket on the water pump - you may need to look at it later so you know how the new gasket attaches to the new pump. There is another smaller inlet pipe coming from under the heat shield. That pipe is held into the flange piece by an o-ring. You must gently pull the flange toward the front of the car to release the o-ring. The new water pump comes with a new o-ring. Replace the o-ring. Don't try to press the flange back onto the o-ring just yet. It'll be easier later. Be sure the flange surface is clean with the remnants of the old gasket carefully scraped off. This is for the water inlet pipe flange as well as for the opening in the front of the engine where the water pump goes. When you're replacing the water pump, a little sealant on the water pump where the main gasket goes will prevent said gasket from slipping when you jockey the water pump onto the engine. I inadvertantly ripped a gasket by not doing this and had to do the whole job over again. First bolt the water inlet flange onto the new water pump, using the new gasket that came with the pump. Tighten to 14-19 ft-lbs. 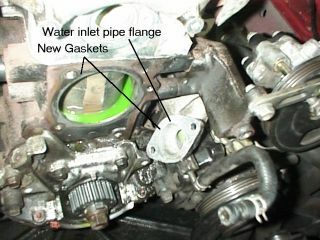 Then position the water pump against the engine opening with the other new gasket in place, while at the same time ensuring that the o-ring on the right slips into the other side of the flange. Push the flange against the o-ring to seat it as much as possible. By now you should be able to bolt the water pump back into place. Torque to 14-19 ft-lbs. 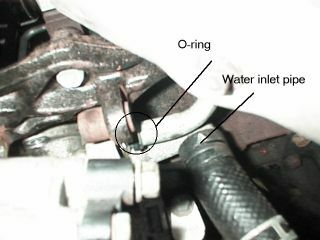 By tightening the water pump to the block, the o-ring will end up in the right place. Double check it to be sure. Replace the idler pulley and the timing belt tensioner pulley. You're now ready to continue with the remaining steps in replacing the timing belt.